Hello stampers!!! Welcome to Mrs. Lincolns Inkin'!! 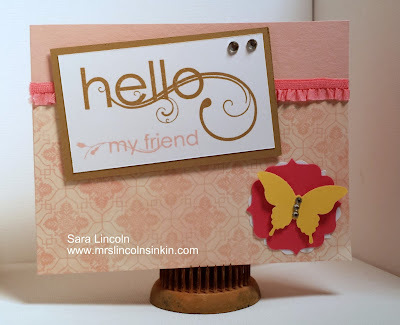 Today's share is of a simple card that you could make just to say "Hello" to a dear friend. My card measures average size of 4 1/4" x 11" scored at 5 1/2". 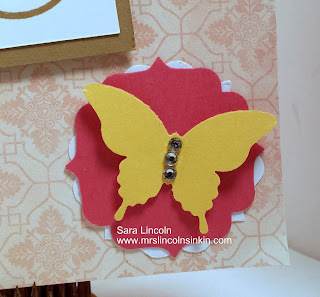 I chose to use a piece of Venetian Romance DSP 3/4 of the way up my card and then allow my Blushing Bride card stock show through just at the top. I separated the 2 with a piece of the Strawberry Slush Stretch Trim Ribbon. I LOVE this ribbon. It is soooo easy to work with and makes creating boarders a cinch!!! For my greeting i used the My Friend stamp set on a piece of Whisper White measured at 3 1/2" x 2" and then backed with a piece of Baked Brown Sugar measured at 3 3/4" x 2 1/4". 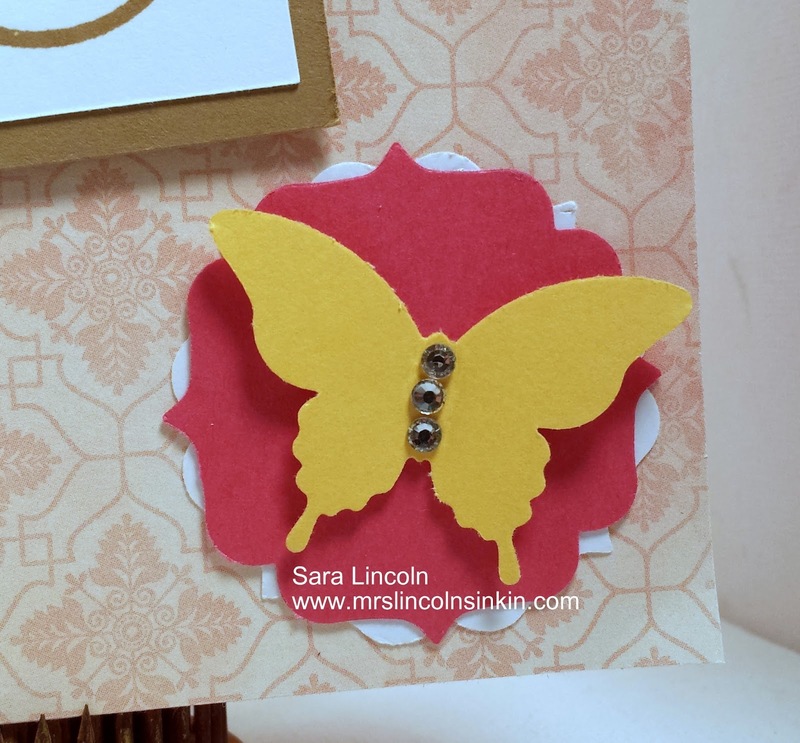 To top it off i used my Elegant Butterfly punch in Daffodil Delight and added some "bling". Now an announcement from SU!. The Magnetic Platforms (item 130658), which has been on back order for months now, are finally ready to be shipped again!!!!! On September 12th you can order your very own FINALLY!!! Don't hesitate though, this is a very hot item and stock goes fast!! !